Q: We have a horizontal vessel in which we are separating lean caustic from disulfide oil (DSO). To measure the level of the interface, we are using a differential displacer transmitter, based on the specific gravity of DSO and caustic. 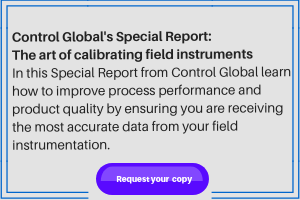 Due to the variation of the specific gravities of caustic and DSO, it is hard to calibrate the transmitter, and therefore, it is always out of service. Would you please help us with this problem, and tell me which kind of transmitter would be best for this application? A: I suggest that you consider Berthold's non-contact level sensor for your application (bit.ly/1l3xjcv). A: Since you have not supplied detailed information associated with the vessels, process data of minimum and maximum specific gravities, or height of interface measurement, my advice is only referential. If you have so much instability in the specific gravity and can't maintain the separation properly, then you have to analyze the possibility of using one of the following systems. A guided-wave radar transmitter can generally detect the interface points fairly well, but the process needs to be stable enough to have a clear and well-defined interface area. If the interface is not well-defined due to turbulence, miscibility issues, etc., then you may require a stilling well or other means to create a calm area for the interface to form properly. Another option is to use a capacitive-type level transmitter. The biggest question with this sensor is whether the measuring chamber, as well as the residence time in the vessel, are suitable for producing a well-defined interface. Yet another option is to have two dedicated density sensors measuring the density of each of the caustic and the DSO layers, and then use their signals to modify the hydrostatic heads on the two sides of a differential pressure transmitter, so they compensate for the specific gravity changes. This method will work only in systems that are very slow, and allow for the changes to be measured and applied to the interface detector signal. This system, when it was used many years ago, required very specific calculations, and even then, if the differences between the specific gravities varied too much, it could still cause errors. My suggestion would be that you contact companies like Endress+Hauser, Rosemount, AGAR, Honeywell, ABB, etc. A: I suggest you consider using a contact-type radar level transmitter. A: The dielectric constant of disulphide oil (RSSR) is on the order of 6 to 7.5, and it will be floating on the dilute NaOH. The dielectric constant of the latter is more difficult to determine, but it should be above 20. This makes guided-wave radar a reasonable candidate. The same transmitter can give both level and interface, provided the thickness of the disulphide oil is more than 100 to 150 mm. If you can access the vessel internals, one of the usual vendors (Emerson, Magnetrol, etc.) will likely be able to check the feasibility for you. The level/interface signal relies on the existence of a sufficient difference in dielectric constant to reflect the signal, rather than an absolute knowledge of the value. Trying to use an existing external displacer chamber is of doubtful utility, as you need tappings in all three phases at all times for the levels in the external chamber to match those inside the vessel (a common source of failure of density-type measurements). A: When you are asking for help on these matters you should always give the necessary process conditions (e.g., pressure and temperature range, density, etc.). I am thinking that this could be an ideal application for guided-wave radar (GWR) level, but without knowing the process conditions, it's always hard to be definitive. In this case, the density is important because it will not work if the caustic is the less dense material and is the top layer. So I'm hoping that DSO is less dense and has a very low dielectric constant. If the top layer has a high dielectric constant, you'll measure the top of that layer and not the interface. Also, there are temperature and pressure limits on the GWR. On the other hand, GWR will not work when the caustic is the top layer. Similarly, a capacitance probe will give you the thickness of the caustic layer, but only if it's always on the top or bottom. Figure 1. Guided-wave radar may be the simplest solution to this measurement problem. The sensor on the left is from Magnetrol. The one on the right is from Emerson. I believe that you have a bigger problem than level measurement. I suspect you have a separator of some sort, but if the two materials are so close in density and also vary (one moment one is denser and at another moment, another is denser), then I think you have some serious process problems. A level profiler would probably work in providing a complete profile. However, these instruments are very expensive (several hundred thousand dollars). I think that your team musthas to go back to basics and really understand what needs to happen from a fundamental process design. There is not enough information on the design to say what is needed. The level profiler will most likely work, but I suspect that a level measurement may not be what is required. A: Measuring the interface in a separator requires that the top layer always be lighter than the bottom one. If that is not the case, the separation will not occur, and it is the process itself that needs to be fixed, not the selection of the interface detector. Assuming that the separator is properly designed and separation does occur, the interface can be detected even if the specific gravity of one or both layers varies. Naturally, in that case, one should not use interface detectors that depend for their operation on density (DP, float, displacement), but should use a property of the two layers that is both constant and different. These include electric or thermal conductivity, opacity, sonic/ultrasonic transmittance, radar (electromagnetic waves), microwaves, etc. In your case, probably the simplest and least expensive solution is guided-wave radar, which can be coaxial, single- or twin-element. The single-element design is the least sensitive, but the most forgiving in case of coating. GWR measures both the total and the interface levels, and is unaffected by specific gravity variations. Operation involves sending a radar pulse down the guide, which will be partially reflected by the total level, but some of the remaining energy continues down and will be reflected by the interface with the higher dielectric layer (Figure 1). Naturally, it is critically important that the dielectric constant of the upper layer be less than 5, and the dielectric constant of the bottom layer be greater than 15.